We have worked with the Met Police to create a hub of digital services that strengthen the relationship between the police and the public. We helped define the strategic vision as “The experience of contacting the police through digital channels as helpful, personal and reassuring as approaching an officer on the street.” In the first instance we have opened up new channels that give greater access to the Met’s services and thus encouraged broader participation from the public. For example, the ease of the new online crime reporting tool has prompted people to report crimes that may have previously gone unreported. Digital channels also provide an opportunity to support a two-way relationship, demonstrated by the “My Local Area” service. 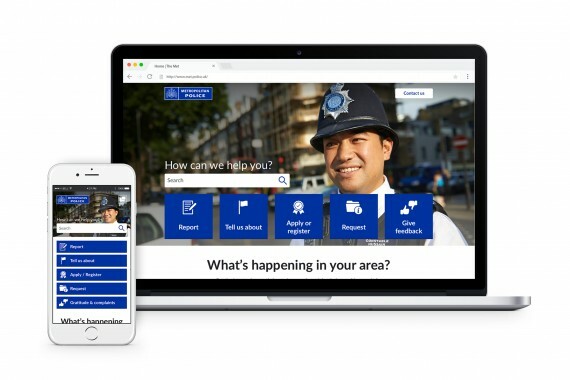 It is a hub of local information for each of the 600+ wards in London, displaying the latest crime figures in the area and combining them with relevant advice on prevention. Through research we learned that local residents wanted to know what the Met were doing to tackle these crimes and concerns, so in response we set up social activity feeds on every page broadcasting updates to their communities. To activate this we trained over 1500 frontline officers in how to use social media to engage with their communities. The service empowers citizens to look after their own safety, but also builds trust between communities and their local police teams. Social media has proven to be a powerful tool in forming new connections with the public. In July 2016 the Met trialled a new public contact channel from the Met CC contact centre in Lambeth. Using Twitter as the initial platform, this was the first example of a UK police service managing incident and crime reports directly from social media, and represented an integral part of an innovative reworking of what contact means to the Met Police in an increasingly digital world. We oversaw the pilot, assisting with the training and development of the operational team, analysing the insights to design expansions to the service, supporting the contact and comms teams in how to use the data to inform response and content, and generally assisted the team in becoming self-sufficient. During the pilot, operators helped some people with serious concerns, some of whom might not have contacted the Met otherwise. There were indications that social media may be used to create “visible police presence” online: a reassurance to online communities and a deterrent to would-be offenders. Twitter enabled the Met to form new connections with the public, reaching a much wider audience and empowering people with the information they were looking for without the need for 1 to 1 conversation in non-emergency situations.